The Rock is always enjoyable - pity this film isn't. RAMPAGE OPENS in space. An off-planet research ship is breaking apart and three vials of genetic altering substance falls to earth. 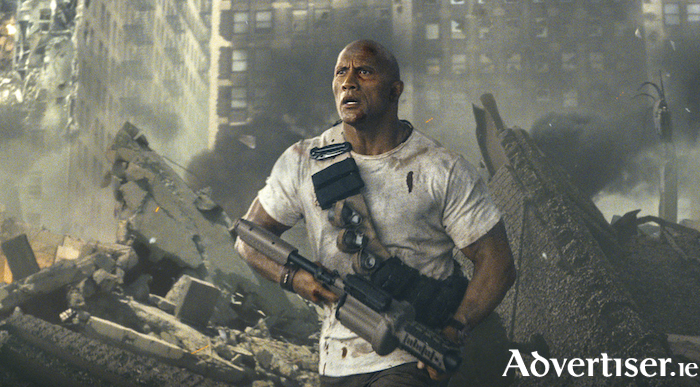 One of them lands in a San Diego wild life reserve run by Davis Okoye, played by Dwayne ‘The Rock’ Johnson. Okoye is a primatologist expert who is ex-special forces (aren’t they all ). His best friend, a one of a kind albino gorilla, named George, comes across the genetic altering subject and starts to grow at an alarming rate, becoming more aggressive. Meanwhile, in other parts of America, the same things are happening to a wolf and an alligator. The owners of the company responsible for this genetic altering substance are the Trump-esque Ackerman siblings. They are trying to get their monsters back so the military can kill them and they can reclaim their samples. The Ackermans release a homing beacon and it calls the monsters towards Chicago. A pretty bad plan by all accounts, so Okoye resolves to save his albino gorilla best friend and foil the twin's plan. To do this he partners up with a engineer recently fired by the Ackermans, Kate Caldwell. While the premise is, let’s not kid ourselves, stupid, there is some serious talent involved here, Kate is played by Naomie Harris (best known from the Oscar winning Moonlight ). The supporting cast is also very good. Jeffrey Dean Morgan (Negan in The Walking Dead ) is also here, chewing scenery the way only he can. Jake Lacy plays the dim witted Ackerman, channeling his inner Donald Trump jnr. Personally I find Dwayne Johnson immeasurably charming, while he can be in some serious rubbish (Baywatch? ) he does really give it his all bless him. Overall, despite the talent, this movie is not worth seeing. There is one scene, set in a collapsing skyscraper, which might be more unbelievable than the overall premise of a giant albino gorilla, wolf, and alligator destroying Chicago. It is the type of building collapse scene a 9/11 conspiracy theorist would question. It is hard to remember a movie which has left me feeling so little, I didn’t even hate it, I wish I hated it. I hated Batman v Superman, but hatred is an emotion. It made me feel something, (mainly contempt for Ben Affleck ). I actually think I had forgotten the first hour of this movie by the time it ended. Now keep in mind the movie is only an hour and half. The budget was $120 million dollars. I think $120 million thrown into the ocean would have more of an cultural impact. At least we could have had articles headlined “Dwayne ‘The Rock’ Johnson just threw $120 million into the ocean”. That would be a headline I would click on. If someone asked anyone involved in this movie to explain the plot in one years time they will not be able too. This is the worst type of film. It’s nothing. So forgettable it’s offensive.